With school right around the corner, it’s time to get organized! Papers, projects, and goals are staring right at us. Now is the time to set-up a family command center that helps your family keep it all together. I know I struggle with keeping all the deadlines and papers straight, even with much of the communication from the schools moving online. 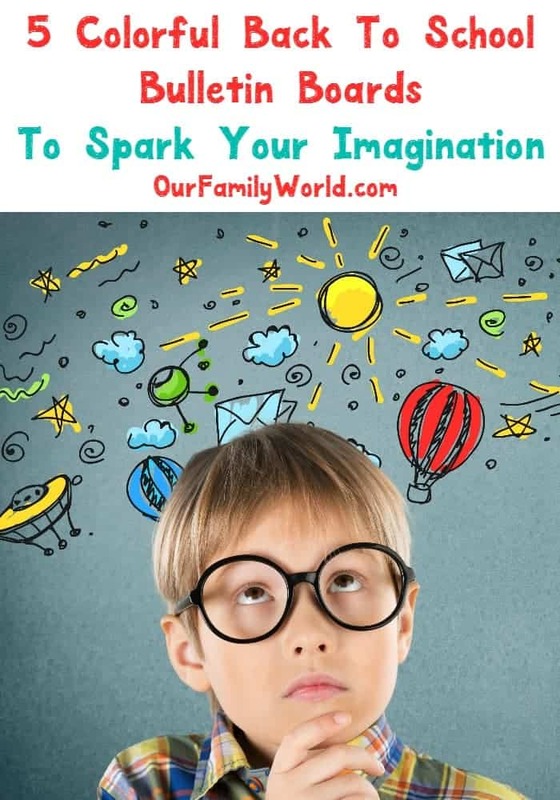 Check out some of our bulletin board ideas that will spark your kid’s imagination, and keep you sane. Do you make a back to school bulletin board for your family as they head back to school every year? Tell me about how you keep your family organized down in the comments! Need a pop of color to keep the whole family organized? I love this paint swatch calendar! Even with an online calendar, not all of my kids have mobile devices. One like this set-up near our kitchen is just what we need for all of the big events and deadlines. You better believe all of my daughter’s swim schedule will be on it! I know this might sound a bit crazy, but last year I ended up making a calendar on the fourth day of school. By then, I didn’t have time to run out and buy something fun as most of my budget had been spent. Instead, I made something similar to this sticky note calendar. This idea served us well as a family bulletin board, though it did require a bit of time on my part to change it out every month. I love how this version blends into the home decor seamlessly. Sunshine and quotes from Grandma? What a lovely way to start off the school year. I love how bright, cheery and organized this bulletin board feels. Check out that color-coded calendar! My inner perfectionist is leaping for joy with this fun set-up. More importantly, I love how these are words and images that can inspire my kid every day before they head off to school. This bulletin board set-up has a little bit of everything. Check out all the features this savvy mom added including a chore chart, calendar, place for notes, and some beautiful decor! The gallery wall style is such a fun trend right now, and I love how this fun mix all comes together into an epic command center. Sometimes less it more, which is why I love this to-do list board. There is a huge open space for your family to write notes back and forth, or to keep the most important family projects on top. Did you see the cute spot for hanging papers? Perfect for those last minute forms you almost forgot to sign for school. Aw these are really good ideas! I’m especially loving that calendar!! Anything to help with organisation I say. I really like this idea. I have been searching for the perfect erasable calendar, and never thought of just making it myself. Love the way this turned out. Wow, I like those bulletin boards. My son will be going back to school and this is really helpful. Great ideas, but my favorite is the paint chip calendar. It is so colorful and fun. It would be good to have my little ones make one to teach calendar skills! The sticky note calendar’s easier to assemble though I’m equally a fan of the others as well. Best to combine two of them here! Those are all very nice. I have a board that I use a dry erase marker on for school actives and such. It’s great for keeping track of everything. If the budget is running out, the effort is definitely worth it. I like the idea of having a bck to school bulletin board. I love how creative all of these bulletin boards are. They really do spark the imagination, even if you are too old for back to school. My favorite is the paint swatch calendar with the dry erase on glass. That is pretty brilliant! I love the bulletin boards. I should make a command center in our home so that i can keep up with my kids school activities. Gallery wall style is looking so cool. Wow Great ideas and awesome tips. I absolutely love the first and last one! The paint swatches one looks super simple to make and easy to manage. All great ideas! Back to School is always going to be so much fun and these School Bulletin Boards look quiet amazing. They are simple & easy to do, the Sticky Note Calendar and Gallary Wall Style are the best among them! I’ve seen some pretty imaginative bulletin boards. These tips should help in the new school year. All of these ideas are so cute! I love the idea of using paint samples as a background. Cute ideas, I actually use some of these already. Our calendar is color coded. Each person has a certain color ink. We have a large command center in the kitchen, it includes, calendar. chore charts, high fives, menu, jobs at meal time. I am so going to try the paint swatches, for the kids individual calendars in their rooms. Loving these bulletin boards! I plan to change the one that I have in the office to a brighter colored one! These ideas are really adorable. They’re the perfect reference! These are very cute and easy to DIY. I love the idea of using the mudroom as command central! I love some of these ideas. I need to try and be more organised this year.